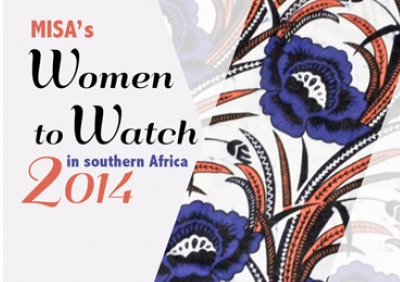 WINDHOEK, NAMIBIA –The Media Institute of Southern Africa (MISA) today announced the first annual MISA’s Women to Watch, to mark International Women’s Day, which is celebrated around the world on 8 March each year. MISA is honouring 12 dynamic­­ and inspirational southern African women who embody both the official United Nations theme for International Women’s Day 2014 – Equality for women is progress for all – as well as the theme designated by non-governmental organisations around the world – Inspiring Change. The 12 women, who are all under the age of 40, are profiled in an electronic magazine available on MISA’s website, www.misa.org. “From a beauty queen-turned-UN communications specialist; to an art photographer challenging mainstream ideals of beauty; to a human rights lawyer fighting for freedom of expression, the twelve women profiled in this publication are all contributing, in their own unique and creative ways, to making southern Africa a more conducive environment for media freedom and improving the ability of all people – including the vulnerable and marginalised in our communities – to access their right to freedom ofexpression” said Ms. Titus. Ms Titus said, “I would add to this that countries with more women in the media have a better chance of reflecting the voices of all members of their populations, of achieving greater participation of women and of providing fair and balanced reporting on women’s issues and rights”.